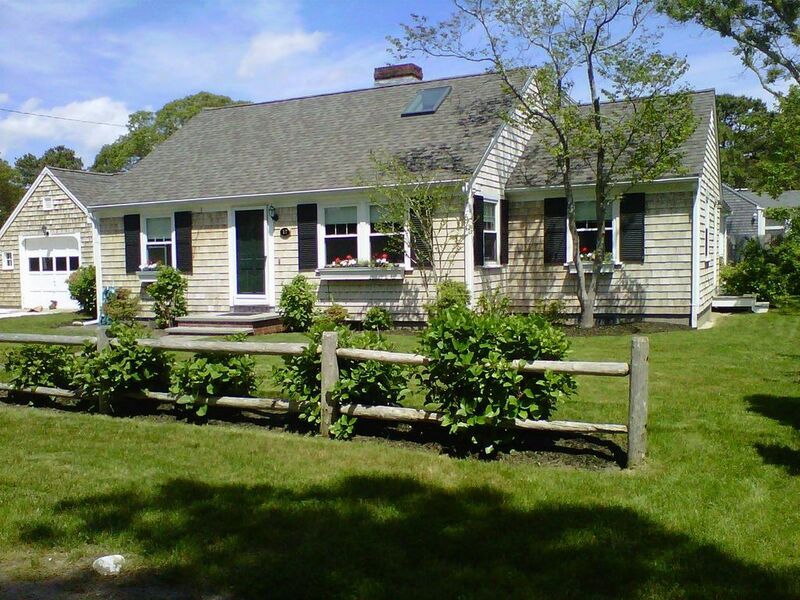 This pristine 4 bedroom, 3 bath charming Cape Cod home is only 0.2 miles to Pleasant Road Beach with an excellent location close to Harwichport Center, shopping, restaurants, golf, tennis, bike trail and grocery stores. Newly renovated this home features central AC, granite countertops, tasteful décor, flat-screen TVs, wireless Internet, DVD player, Wii game system, washer/dryer, stainless steel gas grill, beach chairs, and large family room with counter seating and wet bar. The 600 sq. ft. stone patio is a great spot for eating outside or laying in the sun. The garage is a rustic hangout complete with indoor/outdoor ping pong table. This home has been completely transformed into a charming beach house just steps to Pleasant Road Beach. Attention to detail and convenience makes this your perfect family and friends vacation destination. Several redecorating projects were recently completed throughout the house including the installation of central AC . You won't be disappointed with the cleanliness, comfort, convenience and beauty of this home. This home is lovingly maintained with attention to detail. We love our beach home and are constantly making improvements to the property so that our guests are as comfortable here as they are at their own home. This home is a great place to bring your family, have a reunion or switch it up and have a girls shopping or guys golf weekend. Included are all the amenities of your home away from home. We have many repeat guests so book early for best availability. My husband and I have enjoyed renovating and decorating our homes for many years. This Cape house has been our latest project since 2011. My parents purchased a home in this neighborhood in 1995 and we have enjoyed visiting Pleasant Road beach with our children for over 20 years. The location is perfect for walking to many locations. The family friendly beach is only a 3 minute walk. Sundae School is about a mile away so you won't feel guilty eating ice cream after dinner if you walk there. Harwichport center is also about a mile away in the other direction, but it will take longer if you like to take detours down the many streets that lead to the amazing waterfront properties. Chatham is only 8 miles away for your shopping and shark-watching pleasure. Over the years we have also enjoyed exploring the many local Harwich beaches and ponds. If you purchase a beach sticker you can visit over 20 different locations. outdoor shower, Completely new with plenty of places to store your gear. All bathrooms have been remodeled. Pleasant Road Beach is a leisurely 4-5 minute walk. It's 2/10 of a mile from our home. New central air conditioning will be installed for 2018 summer! The one-car garage is a rustic hangout space to play games like ping pong. There are garage doors on either end that you can open to let in cool breezes. We have a closet full of a variety of great family friendly games to play. There are several games in the garage for your family to enjoy: croquet, Can Jam and corn hole. There are two outdoor eating areas: a picnic table that generously seats 8 on the stone patio and a glass table and chairs on the upper wood deck. Each table is shaded with market umbrellas. There are two outdoor eating areas: a picnic table that generously seats 8 on the stone patio and a glass table and chairs on the upper wood deck. Each table is shaded with market umbrellas. The shed is stocked with 8 beach chairs, beach umbrella, rolling cooler and beach caddy to transport your gear to the beach. Loved the property, totally organized with puzzles and a wonderful kitchen and dining area for our family of adults! Very comfortable and accommodating! Beautiful home. Separate wing for TV, games, and more. Great backyard. Exactly as described and pictured. Plenty of room for our group of 7. awesome deck/patio. The property was exactly as described and pictured online, and was very clean. It is quite spacious, and our group of 7 always felt like we all had plenty of space. Having both a family room and a living room was especially nice. We also really enjoyed and utilized the outdoor space -- deck with table for 6 (and we squeezed a 7th chair in), patio with picnic table that could have sat 8 comfortably, and large yard (which we didn't even use -- we wished the evenings had been cooler so we could have used the fire pit!). The house was also very well stocked with amenities and activities (both indoor and outdoor). We would definitely stay here again! Beautiful, comfortable home with a short stroll to the beach. Highly recommend this home for family time at the beach. My family has stayed here for 4 summers and we all say how comfortable and spacious this home is especially for a large group. Plenty of room for great gatherings. You literally have to pack only your personal belongings as this home has everything you need for your beach vacation. Attention to detail and beautiful furnishings but kid friendly! I highly recommend this home. We love it! We love having you and your family stay at our house and appreciate all of your kind words about the many improvements we made over the winter. We love our home and continue to make changes so our guests are comfortable and have all they need for a fantastic vacation. We're so happy you're coming back next year! This house was very clean and organized, and the decorating in the house was lovely. We very much enjoyed staying at the house. We particularly enjoyed the modern appliances in the kitchen, and the many showers available. The extra family room (with the TV) was comfortable. We found that the air conditioning in the bedrooms was fine, but I am not sure how warm the rest of the house would get if it was a hot week. Overall, it was a very nice house. We are thrilled you had a great vacation and thank you for your kind words about the house. We will absolutely make sure that we have fans available in the future. It's a great suggestion and even though there are great cross breezes in the house and the back family room, extra air flow is necessary when there is high humilty. Thank you for your feedback. $3,900/week for 2018 season Linens are not provided. Cleaning fee $200. Check-In is at 3:00 PM; Check-Out is at 10:00 AM This rental is a SATURDAY TO SATURDAY rental.